Is there anything more magical then the whimsical miniature world of a snow globe? 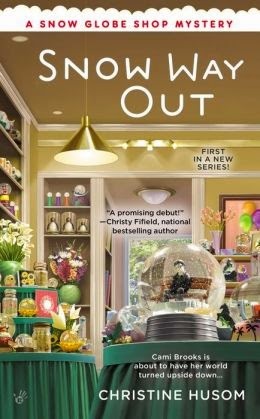 I've always been enchanted by them, so the idea of a mystery series set in a gift shop that specializes in snow globes really excited me. The central characters of Snow Way Out are a trio of friends: Camryn Brooks who runs Curio Finds alongside The Brew Ha-Ha coffee shop managed by childhood friend "Pinky" Nelson, and teacher Erin. The big news in Brooks Landing is the recent jail release of Jerrell Powers who robbed Erin two years prior. As Cami and Pinky prepare for the evening's snow globe making class, they realize that Jerrell's ex-wife and current girlfriend will both be in attendance. Following a somewhat contentious altercation between the women following the class, Cami discovers a snow globe in her shop that is not a part of her inventory depicting a man on a park bench. On her walk back home through the park she stumbles upon the exact same scene...only it's Jerrell Powers on the park bench and he is dead with a knife sticking out of his back. Back at Curio Finds the mysterious snow globe has vanished, and soon whispers between her dear friends has Cami suspecting the worse. This was a wonderful debut to a promising new series. I was completely stumped as to the identity of the killer but had a sinking suspicion about one of my favorite secondary characters, and I was proven right. I look forward to spending more time with this great cast of characters. There's only one thing missing...Cami definitely needs a cat! I don't have any snow globes but I love your cat snow globe above! Thanks for the opportunity to win a copy of Snow Way Out! That is a beautiful snow globe and the book looks good too. My favorite belonged to my hubby's father and has a deer in it, we have it in a cabinet in the diningroom now ( away from our kitties). I have one that one of my children made me in school for Christmas .. A snow globe that predicted a murder? sounds like a great mystery! ! My favorite one has children skating. It is a Christmas snow globe. My favorite snow globe is a Snow Babies snow glove. It has a cherub inside it with snow babies around the snow globe. It provides such a whimsical but loving feel when I look at it. I used to collect those cheap tourist snowglobes with landmarks inside. I know they are kitchy but I loved everyone of them. Then in one of our multitudes of moves, the box they were in was lost. My favorite one was the Space needle in Seattle that I got in the 1960's when we visited there when I was a child. Melissa, your snow globe is precious! My sister is a snow globe collector and has given me a few, so they're all precious to me. I have two, one is a snow scene with the Winnie the Pooh characters, I bought it when my girls were young and I always loved the detail. The other is Cinderella's castle just because I have always been fascinated with it. I love the picture of yours it looks beautiful. I love snow globes, my favorite ones are my Disney Snow White and the Seven Dwarfs ones. I have four snow globes with them.. I collect all things Snow White and the Seven Dwarfs. I've only ever had one snow globe. A friend gave it to me for Christmas years and years ago. I still have it and put it out every year for the holiday season. What a great premise for a book. I had a plastic, touristy looking snow globe as a kid that I loved. It had a winter scene in it and boy, did I like to make it snow! Thanks for the chance to win! My favorite snowglobe is one my mom had made for me a few Christmases ago. It had a photo of 2 of my dogs who have since crossed the Rainbow Bridge. I'd love to add this book to my TBR pile! I used to have a cute cat one but; it got broken. Love snow globes.Pretty book cover. Sounds like a great book. I don't have any snow globes. But I do think they are beautiful. Melissa, your snow globe is stunning. Many thanks for your great review. I love your blog spot and wish everyone could win a copy of Snow Way Out. Your snowglobe is pretty. Pop used to love and collect snowglobes until we found out how toxic they are to cats if they break. Cats die instantly if they lick that antifreeze inside. 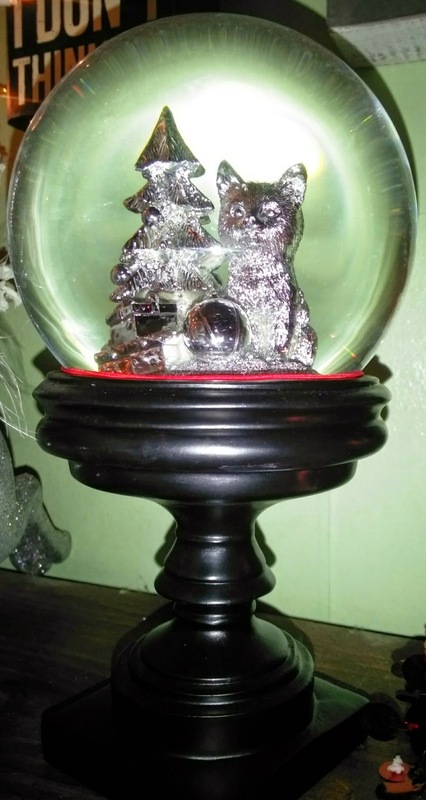 Love the cat snowglobe. I still have a 101 Dalmatian snow globe I treasure. my favorite snow globe is a Christmas snowman snow globe...it runs on batteries and when the color wheel goes around on the inside bottom of it,the "snow" turns every color of the rainbow...I leave it out until Valentine's Day. I have a carosel horse snow globe that's my favorite. I loved snow globes as a child but don't have any as an adult. Thanks for the giveaway. My favorite snow globe belonged to my grandmother and had a church surrounded by trees. Thank you for the chance to win~your book sounds great! I don't have many snow globes but I do have one that is a Christmas Tree that has small presents under it and is musical - it's my favorite of the snow globes - I have way more music boxes. Short and sweet book review - very nice! Thanks for the giveaway. My favorite snow globe is a Christmas one! It was the last gift my daughter got from my Mom before she passed! My daughter has a pretty good size collection! I love your cat one! Thanks for the chance! We had a snow globe, but I haven't seen it around for ages. It was a scene from Vienna. So beautiful. I have loved snow globes since I had a little one with Rudolph the Red-Nosed Reindeer when I was very little. I do have a collection. I'm not sure about my favorite, but I am partial to a small Jim Shore snow globe with Mickey and Minnie dancing inside. I have one with a Christmas scene that my sister gave us a few years ago. Always love to have it displayed during the season. I have a beautiful Wizard of Oz snow globe that plays music. I love it, since that's my favorite movie. :) This cozy sounds SO good! My favorite Snow Globe is of Santa skating in a Winter Wonderland. I purchased one from The neiman Marcus catalog about 12 years ago. Their Christmas catalog is so much fun to recieve if just for dreaming. I could afford the snow globe so purchased it for my daughter. It's of the NY skyline with a cab that runs around the city inside when wound. It was before 911 so the twin towers are in it as well as the Empire State Building.